Clone Wars Bloopers: Ep. 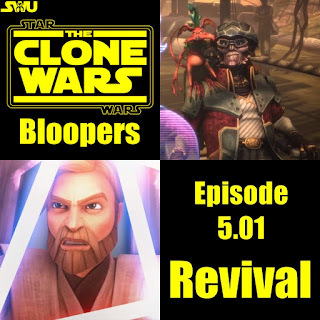 5.01 "Revival"
The Clone Wars is back with another fantastic episode! 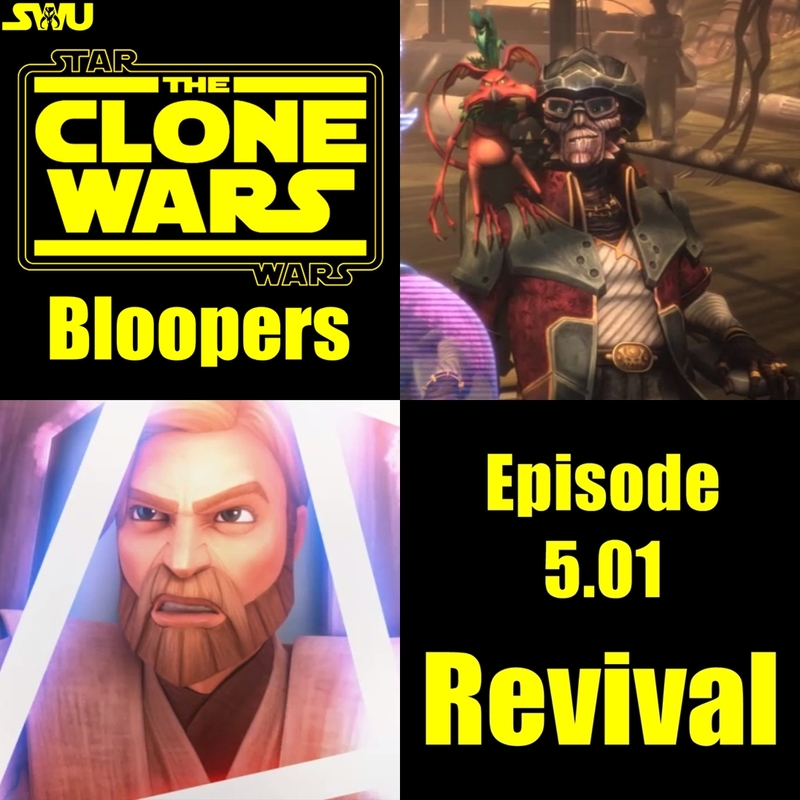 And that means more Clone Wars Bloopers! This episode featured several crazy mistakes... You'll see what I mean! First off, Maul picks up and crushes the Yellow Droid and holds him in the air while Savage rushes into the room and destroys the Droid standing between the table and the door. He then uses the Force to pick up and slam the other two into the the opposite wall. But afterwards things change, there are now two droids where Savage was just standing. And the two Droids that were slammed against the wall do not appear to be where they're supposed to. Just after Adi Gallia is killed, Obi-Wan uses the Force to grab her Lightsaber and retreat into Hondo's compound. As he is walking backwards into the building, fending off the attacking Pirates, he is not carrying the Lightsaber, nor is it on his belt... Or is it? In several frames it looks as though the Lightsaber isn't there. But as Obi-Wan moves a strange outline appears and disappears. I believe that it could be a result of the shadowing for the Lightsaber hilt being applied but the Lightsaber itself did not make the final cut. But that's just my theory, what do you think? Let me know your thoughts in the comments below! Next, when the ramp of the Cargo ship first drops and the characters walk down it, the ramp does not extend at all. But when Maul & Savage reach the bottom it is now extended... A little. Notice the yellow & black strip. But he is in the next shot. Afterwards, During the chase scene, Maul & Savage are out in front chasing Obi-Wan & Hondo. But when they round the corner two of the Pirates are in front of Maul. Here we go again with the Lightsabers! 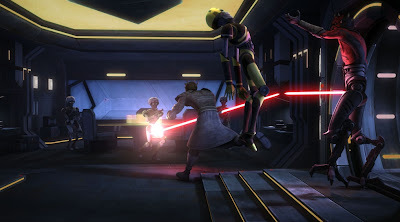 Look closely as Obi-Wan is running out of the compound chasing Maul, you can see that Obi-Wan is not carrying Adi Gallia's Lightsaber, in his hand or on his belt. Later, when Maul & Savage are escaping, the Pirate carrying the rocket launcher is, at first, wearing a white hat and a red Bandanna over his mouth. Moments later, when he fires the weapon, he is only wearing a green hat. If you enjoyed this edition of CWB feel please click the Share buttons below, it helps out a lot! If I made a faux pas of my own, or perhaps I missed something, please let me know in the comments below. This was a great episode! Season five is the first to premiere with only one episode and it still ended up being one of the best season openers to date. I've been quite interested in Maul & Savage's story and it was really amped up this time. Seeing Obi-Wan turn the tables on his foe and leave them wounded and on the run was a delight. No doubt this will make Maul want "Revenge" even more on old Obi now. But the best part? Hondo! His brilliant dialogue, coupled with Jim Cummings' excellent voice work makes Hondo Ohnaka one of my favorite Star Wars characters. He needs his own spin off series, seriously! also obi-wans' Jedi friend dies in this first season 5 episode then reappears right after in the council meeting in the next episode lol whoops!